Between 01/08 and 08/08, the Prefecture of Okinawa together with the Karate Kaikan, surprised us with a world-class logistics to host the so-called “1st Okinawa Karate International Tournament” (第1回沖縄空手国際大会 ) whose name is due to the fact that currently the Olympic Committee only estate that holds the possibility to organize “World Tournaments” and deliver the respective “titles”. However, with a participation framework of more than 1746 competitors from 49 countries of the 5 continents, the level was at the height of an event that was highlighted by the relentless emphasis on maintaining the high standards of execution of the traditional katas of the respective lines: Shuri / Tomari-te Kei, Uechi-Ryu Kei, Naha-Te Kei and Kobudo. 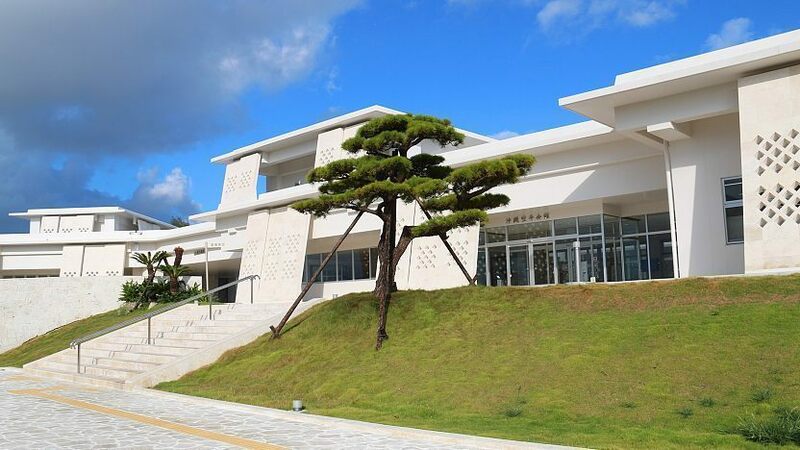 In support of this mission and as a result of the systematic efforts of the Prefecture of Okinawa to preserve, transmit and develop Okinawan karate, “The Karate Kaikan” (Click here for further info) was inaugurated on March 4th, 2018, facilities that include museums, shops, dojos and libraries dedicated one hundred percent to contribute to this mission. This is the place where it was decided to hold the first Okinawan karate tournament. As has been the trend in the last events held in Okinawa, our organization was present to participate in this event and together with the school of Mirzon Zambrano sensei (Okinawa Goju Ryu Jinbukan) and Diego sensei’s adhesion from Europe, Chile was represented splendidly by 11 competitors, who took part of the Karate and Kobudo competitions in all the divisions. Okinawa representative team, who made the qualification round in May 2018, were waiting and observing the turn of Japan & Overseas that took place on August 2nd and 3th to determine who would accompany the homeowners in the main tournament. Naha-te Kei – Uechi-ryu Kei – Shuri / Tomari-Te Kei and Kobudo Sai-Bo, were the four categories performed in the Okinawa Prefectural Hall of Martial Arts (Budokan) Arena and the Karate Kaikan, Special Dojo, where the hundreds of competitors gathered to start the fight for the podium. The category of Shuri / Tomari Te Kei, with a margin of participation close to a thousand competitors, was the division that registered the most attendance, classifying the main tournament only the best 32 of each division (Junior Female / Male I-II, Seniors Female / Male I-II). Diego Sensei (who qualified 1st in the preliminary round, Seniors I) and Mauricio Lopez (Seniors II) were the representatives who managed to advance in their respective groups to the main event that began on 04/08. Isshinryu Seisan Kata, Isshinryu Sunsu Kata and Isshinryu Kusanku kata (Click here to check the videos), were chosen to present until unfortunately, the high standards regarding “root / origin of the kata” (the katas presented should be as little modified as possible, thus maintaining the pure lineage of each ryuha) were a difficult obstacle to overcome for both, who fell in the first round before relentless judges with the standards that in front of the prefecture of Okinawa just a few days before, they promised to maintain. Naha-Te Kei and Kobudo Bo and Sai were the divisions chosen by the Chilean representatives of Goju-Ryu Jinbukan, led by Mirzon Zambrano sensei, and who, as expected, also qualified to the main tournament from the preliminary rounds, not without some previous tiebrakes they had them busy during the entire day. The overall balance of the team was positive, mainly because the first objective was achieved, which was to represent Chile and Isshinryu in Okinawa, supporting Uechi Sensei at the same time in his work as the only active representative of Isshinryu Karate at the Karate Kaikan and, on the other hand, It is always positive to see how and where is the standard in Okinawa related to the kata execution. In this way, the “1st Okinawa Karate International Tournament” had on the podium those who faithfully maintained the traditional katas, far from the spectacular and bombastic presentations to which we are already very acclimated in the West. Once the tournament was over, a series of seminars was started on 06/08 by the instructors chosen by the Executive Committee based on the recommendations of the four organizations affiliated with the Okinawa Dento Karatedo Shinkokai (the same as for first time in history, worked together to carry out the event). As expected, the representatives of Seishinkan and Isshinryu at the event, participated and supported the seminar lead by Tsuyoshi Uechi sensei, Isshinryu Okinawa Traditional Karate-do Association 8th Dan together with the Board Chairman of Okinawa Dento Karatedo Shinkokai Choko Kyuna Sensei, Okinawa Shorin Ryu Hanshi 10th Dan, who held the Shuri-Te Kei seminar. All the Kihon, Basics Movement and applications, kotekitae (Okinawa Traditional condition training) and Seisan Kata were the topics covered by more than two hours of seminar, which counted with the maximum allowed of participants (50) coming mainly from the Shuri-te line. Ryukyu Kobudo was the other covered area during the participation in seminars, this time by Akamine Hiroshi Sensei, Okinawa Ryukyu Kobudo Shimbukan 9th dan and assisted very closely by Dell Hamby Sensei, 6th dan. Bo and Sai were the weapons covered during two hours of training that contemplated techniques and basic applications, kihon and a kata of bo and sai respectively. As expected, massive assistance from practitioners of various Kobudo lines took the available places. Both seminars, of high technical and theoretical value, contribute significantly to the growth and research work carried out by the directors of our school in South America and Europe, contributing to the development and strengthening of Karate and Kobudo in the regions.